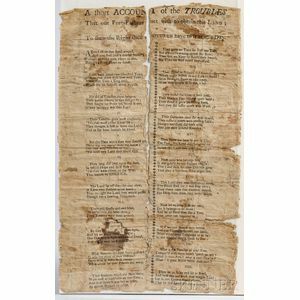 American Broadside, A Short Account of the Troubles that our Fore-Fathers met with to obtain this Land. [No place: no printer, [between 1776 and 1801]. 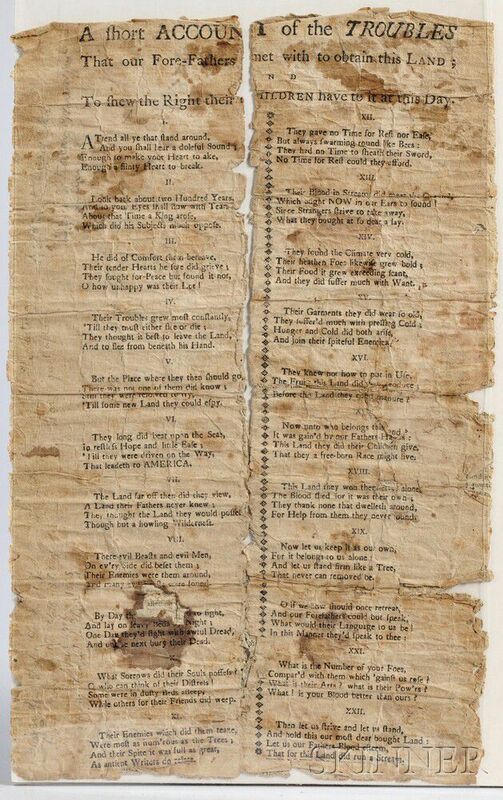 Single leaf of laid paper, broadside printed in two columns separated by typographical ornaments, the verses in twenty-two stanzas, rare according to ESTC, not in Evans, not in W.C. Ford, accompanied by a letter from the American Antiquarian Society, noting that they hold no copy; a variant in ESTC mentions a variant with a Danvers imprint dated 1776; mounted on a newspaper from 1801, both quite worn, old folds, separated into two vertical strips, edges with loss, some staining, 13 x 8 in. The inspiring text refers to the original colonization of Plymouth, Massachusetts by 17th century English Puritans. "Attend all ye that stand around, and you shall hear a doleful sound; enough to make your Heart to ake; enough a flinty Heart to break."